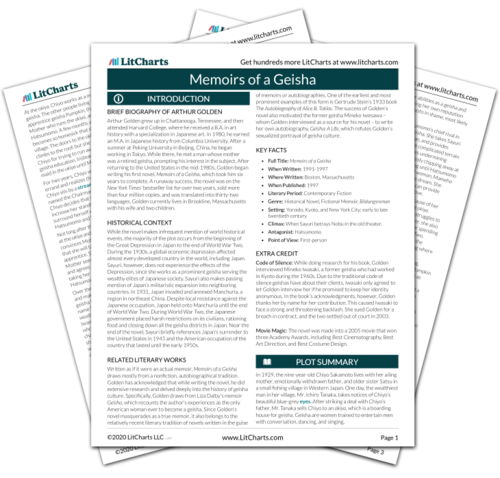 Instant downloads of all 945 LitChart PDFs (including Memoirs of a Geisha). Plaue, Ethan. "Memoirs of a Geisha Symbols." LitCharts. LitCharts LLC, 4 Nov 2015. Web. 23 Apr 2019. Plaue, Ethan. "Memoirs of a Geisha Symbols." LitCharts LLC, November 4, 2015. Retrieved April 23, 2019. https://www.litcharts.com/lit/memoirs-of-a-geisha/symbols.